Rena and Ian enjoy picnics in the park when the weather is nice. They're trying to get in a few more while summer is still here. This time they brought bento boxes with onigiri and inari sushi and kebabs. Rena tends to like to skip to the sweets first and goes right for the chocolate. She has abit of a sweet tooth. Ian entertains them with acoustic guitar music as they while away the afternoon with their dog Noodles. All the food here is from Re-Ment which I wrote about in my previous dollie post. Are you a fan of picnics? Hope all is well with you, are you feeling better treacle? This too cute. Ian's shoes are pretty legit too, LOL! I love picnics, now I wanna have one before the summer ends! Awwwww! They really are the cutest couple EVER. I also love those biscuits so I am not surprised Rena went straight for them. XD Ian is too nice to her though. If I were to ignore my bento and eat biscuits first the boyfriend would not be best pleased with me, let alone serenade me with an acoustic guitar. Haha! By the way I have been a little absent, so I'm not sure if you have done this, but if not, could you please please please pleassse show us how Ian and Rena store all their accessories and clothes?!! Its good to see Rena & Ian making the most of the last weeks of summer out in the sun. I can't remember the last time I had a picnic! Those little bento boxes are the cutest thing ever! And the adorable guitar - What's Ian's music forte? P.S How are you feeling? This is the cutest thing! :') I think everyone is trying to make the best out of the few weeks of summer left. Oh my cuteness - mini sushi in the shape of faces...is there anything cuter? I hope you are doing well dear! ok, why weren't any of my picnics as CUTE as this? HAHAHAHA Rena and Ian look so cute! I love their outfits and cuisine choices Rowena. HAHAHAHA If I had someone to picnic with I would definitely do it. I love fancy smancy picnic baskets! Have a great day! They are so stinkin' cute! I love a good picnic! How adorable is this?! I am dying over those mini sushi faces, omg! Hope all is well Rowena, wishing you a wonderful Wednesday! Way to cute, my god how i adore the mini food items! Like a sweet duo, i am trying to enjoy every last bit of summer (and last fewweek drops of sweat from summer heat) and sunshine too Rowena. Hehe! I love Rena & Ian's series...They are so cute!!! I adore picnics...I'm daydreaming about them even in my last post! I hope you are feeling more like yourself, darling! Adorable :) what a fun picnic they're having! This is super cute. What a very nice picnic! Love these photos. They are so great. Awww a little picnic in the park? I love this post Rowena! First of all, Rena's outfit is adorable, I love her little peep-toe slingbacks. Ian looks great, Love his little guitar! And...of course the little lunchbox is just too cute :) Do I spot angry bird inspired sushi pieces??? OMG! Great Post! I follow your Blog now. 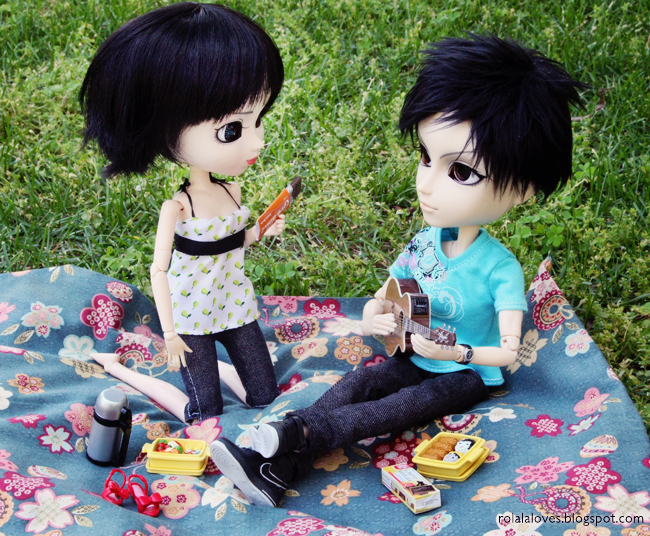 This is totally adorable and yes, I am a fan of picnics! Great blog! Thanks so much for coming back to my blog and following through Bloglovin! I with pleasure am following you back on bloglovin #49! I am looking forward to more of your posts! Adorable picnic in the park!!!! Thanks for your comment, have a good weekend dear! In love with your blog! your pictures are AMAZING! Followed. I can't believe all the things they make in miniature, it's really quite amazing. Sometimes at lunch we will go to one of the parks and they have music playing and cushions to sit on so we can relax a bit. I think a hotel across the street does this but I'm really not sure who's in charge. It sure beats scarfing something down quickly at your desk while trying to meet a deadline. So cute I love their stories. Ohhh my gosh, that is so cool!! How did they make those food items?! Too impressed. How adorable!! Have a great week! awww Rowena they're so cute!!!!! all those simple details are so cool!! love your pictures dear!!!!! Sorry for my absence, hope everything's going well to you! What a cute couple! The picnic is a perfect get-together and I love it too when it's not too hot. I love how you style the shot. The picnic is genius! My daughter would flip over this. Oh Rowena, this is the cutest photo shoot ever! Those photos are so beautiful, and the idea is just fantastic :) Hope you are well!